The Indian company Alpha Pharma is known for producing a steroid product called Parabolin, whose active ingredient is trenbolone hexahydrobenzyl carbonate. The product is produced in the form of 1.5 ml ampoules (a package contains 5 ampoules). 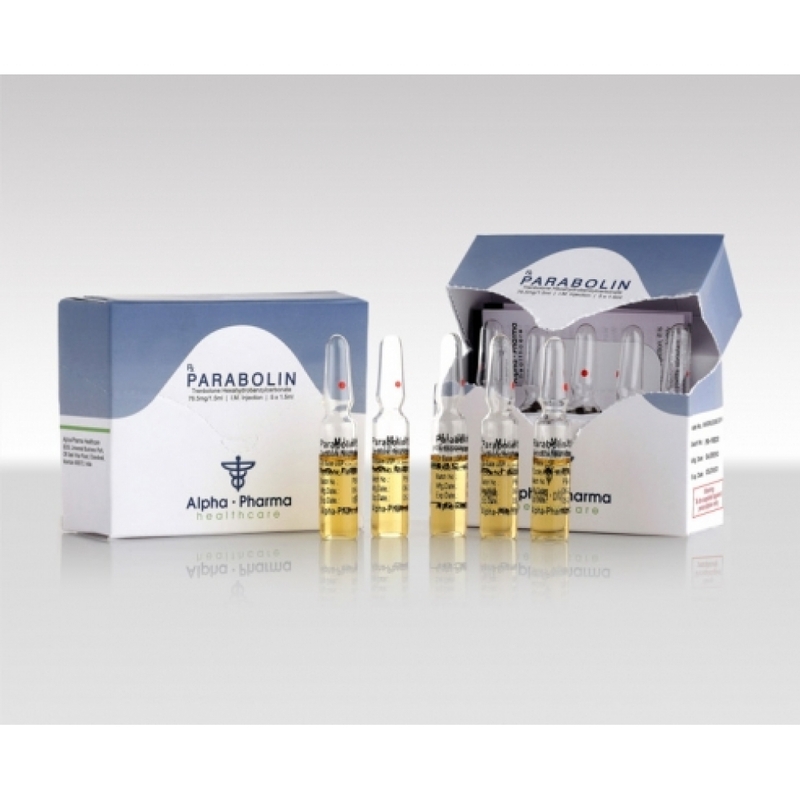 Concentration is 76.5 mg.
Parabolin is endowed with androgenic and anabolic steroid effects. Its key difference from the world-famous acetate is in the length of the ether, the side chain of which is much longer, which prolongs the effect of the steroid on the body. This anabolic is a powerful drug, so the manufacturer does not recommend using it to non-professional athletes. When the drug was created, it was used as an auxiliary product in increasing appetite, as well as increasing the amount of mass in livestock. The process of influencing the body is simple. Initially, when the drug is introduced into the body, the esters at different rates begin to split with the help of plasma lipase. Thus, the hormone is in the blood. Parabolin is endowed with increased anabolic activity, which is explained by its related relationship with androgen receptors, which are five times more similar to testosterone. Often, athletes resort to accepting this product who need to build muscle mass and bring strength indicators to a certain level. As a rule, these people are not afraid of the side effects of such strong drugs. Parabolin has gained great popularity due to the fact that it is not peculiar aromatization. Athletes do not celebrate gynecomastia or fluid accumulations. The recommended course of Parabolin has a duration of 5-6 weeks. It is better to begin reception, having previously consulted with the expert and having handed over necessary analyzes. The weekly dosage should not exceed 300 milligrams, given the long side chain of hexahydrobenzylcarbonate, one injection in 7-10 days is enough. It will be reasonable to start the course with the minimum dosage: this will give an opportunity to check the reaction of the organism, and in the event of adverse reactions, stop taking it. Parabolin significantly inhibits the production of testosterone by the body, and therefore gonadotropin is recommended for administration from the second week to the second week after steroid withdrawal. As PCT used Toremifen or Clomiphene. Taking Tamoxifen is undesirable because the drug enhances the progestin effect of trenbolone. As for how to take Parabolin in combination with other AAS, mixed courses are irrelevant for those who like it, because anabolic is already so powerful, and provides a significant effect. Professionals usually combine trenbolone with nandrolone and testosterone enanthate. The duration of this course is 10-15 weeks, but the likelihood of “side effects” is quite large. In women, symptoms of virilization, depression of ovarian function, menstrual disorders, hypercalcemia. In men: in the prepubertal period – symptoms of virilization, idiopathic hyperpigmentation of the skin, slowing or stopping of growth (calcification of the epiphyseal growth zones of the tubular bones); in the postpubertal period – irritation of the bladder, gynecomastia, priapism; in old age – hypertrophy and / or prostate carcinoma. In men and women, the progression of atherosclerosis, peripheral edema, dyspeptic disorders, abnormal liver function with jaundice, changes in leukocyte formula, pain in the long tubular bones, hypocoagulation with a tendency to bleeding.